RogueKiller for Windows 10 - an easy-to-use application designed to remove malware from your computer. Quickly detects worms, trojans, rootkits, deactivates their processes and services. After that, the user can choose how to deal with them: replace, cure or completely remove. Among the functions of the anti-virus utility, you should highlight the availability of tools for recovering the HOSTS file. Additionally, it can restore DNS and proxy servers, which are often replaced by virus programs. Provides the ability to manage startup and entries in the system registry. 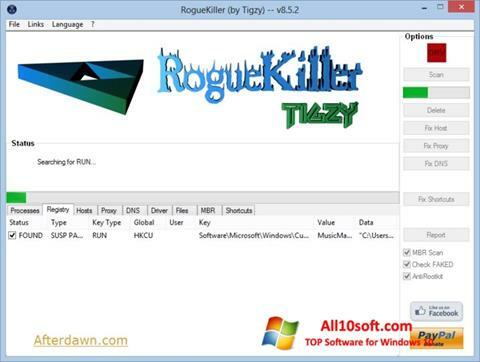 You can free download RogueKiller official latest version for Windows 10 in English.